The Americans failed to generate quality scoring chances throughout. 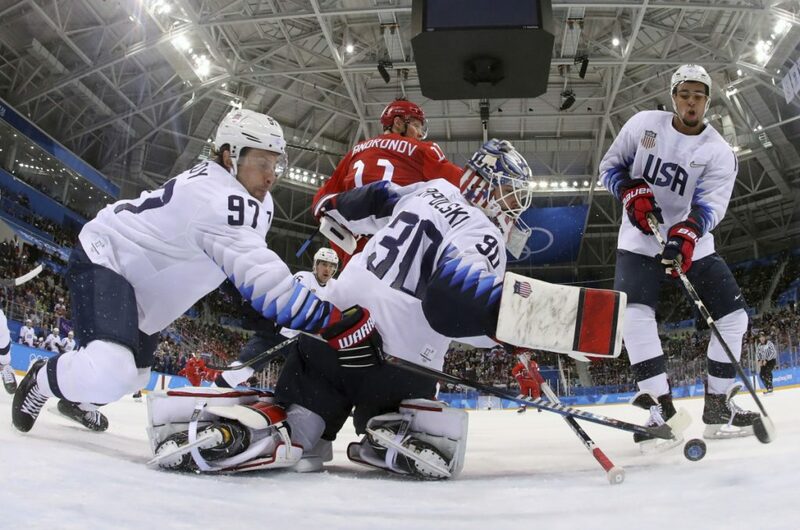 GANGNEUNG, South Korea — Ilya Kovalchuk scored two back-breaking goals as the Russians outplayed, outhit and outclassed the United States in a convincing 4-0 shutout Saturday night as each team wrapped up pool play at the Olympics. With the loss, the United States is guaranteed to have to play in the qualification round Tuesday. U.S. goaltender Ryan Zapolski allowed four goals on 26 shots, including Kovalchuk’s goals less than 33 seconds apart at the end of the second period and start of the third. Los Angeles Kings 2012 draft pick Nikolai Prokhorkin scored the Russians’ first two goals in a dominant performance. As close as the shots on goal were, the U.S. rarely generated the quality scoring chances against Vasily Koshechkin the Russians did around Zapolski, who played all three preliminary-round games. Koshechkin stopped all 29 shots he faced for his first shutout of the tournament. This night lacked the tense political subtext of the Cold War from their 1980 meeting and the pomp and circumstance of Russian president Vladimir Putin attending and the pressure on the home team in Sochi in 2014, but it had the same kind of in-arena atmosphere. 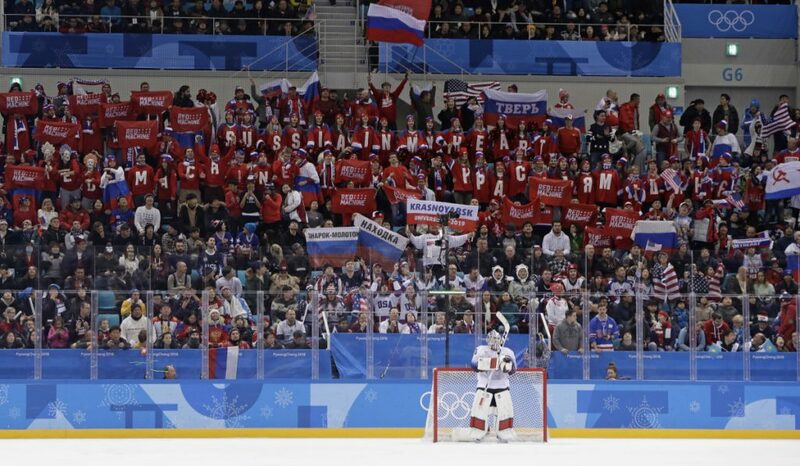 U.S. and Russian fans filled Gangneung Hockey Centre and went back and forth with “U-S-A” and the “ROSS-I-YA” chants that made up the background noise at the Olympics four years ago. There was at least one disagreement in the stands between those fans and plenty more on the ice. Pushing and shoving followed countless whistles, and at one point U.S. forward Jordan Greenway and Prokhorkin got tangled up and came as close to a fight as players can without dropping the gloves. In a tournament full of mistakes, the U.S. made a couple to allow the Russians to take the lead 7:21 in. Alexander Barbanov had all the time in the world behind the net and dished the puck to KHL star Sergei Mozyakin, who found Prokhorkin free and clear in front for the deflection goal. Ryan Donato had the Americans’ best chance of the first late in the period when he pinged a shot off the crossbar behind Koshechkin. The Russians hemmed the U.S. in its zone late in the period, and the fatigue took its toll as the game went on. Left open on the rush as the U.S. was slow to backcheck, Prokhorkin scored his second goal 2:14 into the second, using a Jonathan Blum screen on Zapolski to make it 2-0. The U.S. spent the rest of the second period unable to convert on a delayed-penalty chance and a couple of power plays. Things tilted even further when Sergei Andronov held the puck away from U.S. defender Bobby Sanguinetti and passed it to Kovalchuk, whose shot went under Zapolski’s arm and in with 0.2 seconds left in the second. As if that goal wasn’t deflating enough for the U.S., Slava Voynov sprung Kovalchuk for a semi-breakaway and the former Atlanta Thrashers and New Jersey Devils sniper beat Zapolski clean 32 seconds into the third for a 4-0 advantage. NOTES: U.S. defenseman Will Borgen was a healthy scratch for the third consecutive game. Forward Jim Slater was also scratched. … David Leggio backed up Zapolski.